Week 27… Hello 3rd Trimester! Wow! I am so excited to finally be in the third trimester, but mostly I’m frazzled. We have less than 90 days to prepare– I’m frazzled because I will only have 67 days until his due date (assuming he bakes until his due date!) by the time we move, this is also assuming it takes us until September 30th to be there, but there is a chance we may be there a little sooner than that. I am feeling better because we’ve got great progress on his stuff, and our baby shower is finally on the books: October 19th! This past week I figured out how to do my baby book and I had my glucose test. I’ll talk about both of them below the survey I’ve done in the past– I’m doing it again to keep me organized this week. How far along: Currently I’m 27 weeks and 6 days. Total Weight Gain/Loss: +8.8 Lbs from pre pregnancy. I jumped several pounds this week, and still my midwife seemed perfectly happy with the numbers. Maternity clothes: Yes! But it’s about to be sweater weather and I’ve got a few prepregnancy sweaters that I think will still fit me, and I have plans to buy several more pairs of maternity leggings too. Stretch marks: I’ve been using Burts Bees belly butter, but they are still coming. I’m trying to use it several times a day. I know I can’t stop it, but I’m trying to be less itchy and maybe help with them not be so bright red and angry. Sleep: Some days I take a nap– It depends on what I’ve done that day. At night I usually wake up to pee several times. The dreaded 3am pee that keeps me awake for usually 2 hours. I fall back asleep around 5 and then get up around 7 to pee again, and then sleep till 9-ish. It’s exhausting. I’m having a hard time getting through the day. Movement: Oh my gosh, yes! He usually bunches up a few inches under my sternum and kicks up a storm in my lower abdomen. The other day I felt him go from transverse to up and down (I’m not sure which end his head was). I didn’t so much feel him move, as I felt his kicks go from being on both my right and left sides at the same time, to being at the top and bottom of my belly at the same time. It was so cute and bizarre. Food cravings: Fresh fruit! I also discovered Beano and it’s changed my pregnancy life. I can finally eat fresh fruit without having extreme discomfort from the gas pains. Labor signs: Braxton hicks started at the end of last week. I talked about them here. Pregnancy Symptoms: Same big two: gas/bloat, and back pain. The maternity support belt is a big help and beano is a huge help. I’m not have any swelling, or anything else like that. I’m a pretty lucky pregnant woman. What I miss: I was going to say pumpkin spice latte, but then I learned that they can make it decaf! (Yes, I’m aware that decaf doesn’t mean 100% caffeine free, but it is better than the copious amount that is in the regular drink). What I am looking forward to: Several things!! 1. Our friends from Ohio are going to be staying with us this coming Monday and Tuesday night while they pass back on their way home from Gatlinburg, TN. I’m so looking forward to some lady time, and baby time. 😉 2. Our 4D ultrasound is Wednesday and our mom’s might be coming. 3. Our breastfeeding class is also on Wednesday. ** Now the information about the blood glucose test. C and I ate a late dinner (830pm) and I fasted before the test. They told me it was better to fast and if I had to eat to make it something small. I had my drink around 1020, and I should have just guzzled it because the second half of the drink was very hard to get down; not because I was gagging, but because I was feeling so sick. I had the orange flavor and it was given to me cold. I typically don’t like cold drinks. I drink bottled water usually, and I never put it in the fridge. Anyway, we then went upstairs to our appointment, and then went back down to the lab to have my blood draw. I’ve heard from some people they do a finger stick, but not my hospital. While I was waiting for my blood draw I started to feel the ‘crash’. I was feeling very lightheaded and nauseous. I told them this, and she just told me it was normal and if I felt like I was going to be sick to let her know. She had to stick me twice to get the blood, but I’m not really needle-phobic, so I didn’t mind too much. The best part of the entire thing was the awesome Mexican lunch C and I had immediately after. I was even interested in getting dessert, but I decided that I had enough concentrated sugar for the day. haha. Also! I figured out how I plan to do our son’s baby book. I’ve been struggling with the desire to scrapbook, because I know that despite wanting to do it so badly– I would give up. I was thinking of just building a photo book (like those on Shutterfly), but I wasn’t a big fan of that idea either. Then I discovered the PERFECT option. While wandering Michaels with my friend shopping for baby shower stuff we came across Project Life. I had never heard of it before and I didn’t fully understand it while I was looking at it in Michaels, but I knew I was interested in it. The kits were expensive so I didn’t buy anything that day– Instead I went home and did some more research about it. They sell a kit called ‘Baby Edition for Him’ — It’s being retired right now, because a new set is coming out soon, but this means that the ‘core kit’ for the ‘baby edition for him’ was on SUPER SALE at Amazon.com. Actually, a lot of the Becky Higgins stuff on amazon was much cheaper. So I purchased the core kit, a big package of design A sleeve protectors, and a small package of the plain 12×12 sleeve protectors. Then from the actual BeckyHiggins.com I bought the album, the 12 month dividers, and the matching scrapbook paper. I do plan on doing a post by itself to talk more about this, but I just had to share. I’m so excited and I can’t wait to get to work on it. 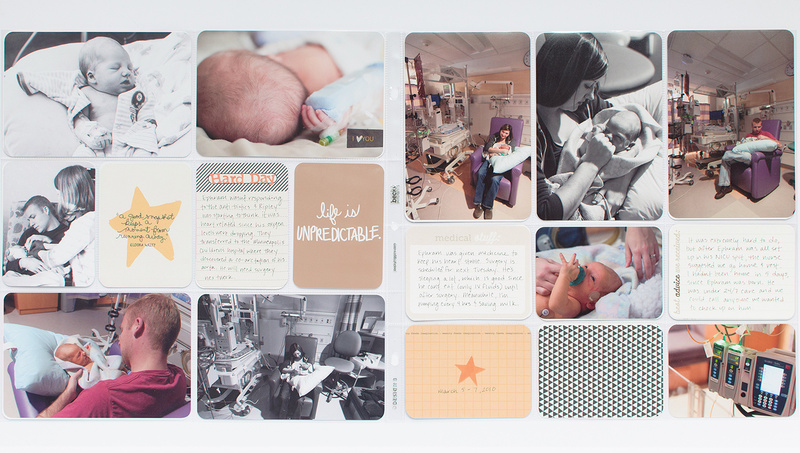 Below I put a few links to give you an idea of what a baby book can look like when you use this system. My Pinterest Board about it: Here. you’ll find using PL changes your memory keeping life – it is so EASY! If, like me, you decide not to do it cause you are all out of inspiration for a while, it takes next to no time to catch up. I did a “skim” version of 14 years for a grandparent’s christmas present in one weekend. My tip to you would be to write your cards out and place in the album as things happen, then worry about printing the photos whenever. Post-it notes are great if you are worried about losing your way. Thank you for the tip! I’m anxiously awaiting my package! I’ve already sent off pictures to SnapFish, and can’t stop thinking about getting a start on the album. I went ahead and purchased 3 more core kits, and a bunch of other stuff from amazon while it is all super cheap. A big pack of Design A is less than 7$! I wanted to build a supply to work on other albums besides his baby book. And thank you. I’ve been very lucky with how smooth my pregnancy has been. Thank you so much for writing about Project Life. I have been looking for a baby album for months now but I’m not a scrapbook-y kind of person but I may actually stick with this system. The set is ordered! Wohoo! You’re very welcome! I hope it helps someone else out as much as I think it is going to help me. I plan to do several more posts over the year to show my albums progression– if you’re comfortable with doing the same I’d love to see it. Good luck!